« Glitch and the LED Sneakers – In Action! Really it all comes down to what you can find… you have to be imaginative and flexible with your plans. I took a trip to my local thrift store and mooched around all the aisles. Then I mooched around them all again. After many “maybes”, instead of the money belt, I settled on a small leather camera case with a belt loop and for the shoe end of things I picked up (an awesome find for $1.50) a back support belt. Yes really. 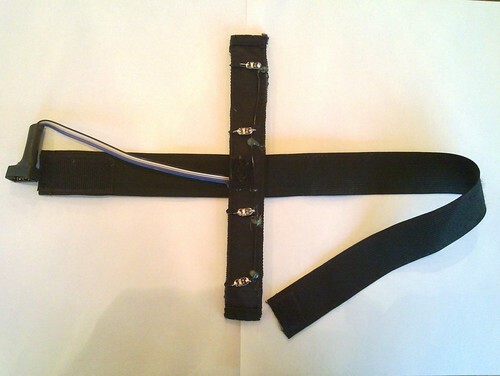 The belt was 8 inches wide, had rigid vertical ribs like a corset (once detached, these would be great to mounting the LEDs onto) and was held up by a set of stretchy braces (suspenders for you North Americans) (which would provide all the stretchy straps I needed) and held together by loads of velcro tabs & fasteners. Just perfect – a tripartite triumph. Once home, I started with the shoe pieces. I cut out a pair of the ribs from the back support belt and hot glued the LEDs in place across the front. The wiring consisted of a common 0v wire running the length of the rib just below the LEDs and the individual signal wires looped up over the top. More hot glue on the back held everything in place. I cut lengths of stretchy strap from the braces and hand-sewed velcro onto the end (note to self: don’t ever hand-sew velcro again… ow ow ow) – this would then wrap around the shoe and fasten back onto itself with the LED rib glued onto the strap at the appropriate point. I cut 8 inches off the end of the ribbon cable and split it into two 5-way wires – one for each foot. These 5 wires I then soldered to the LED wires on the back of the ribs and attached the ribs to the stretchy straps with a big squirt of hot glue, sandwiching all the solder joints in the middle – so no exposed bare wires. Then I soldered the male (PCB mount) half of the Insulation Displacement Connectors onto the other ends of the 5-way wires (the smallest IDCs that Lee’s stocked were 10-way so half the pins were unused but, at under a buck a connector, I’m not complaining). Finally, to protect the soldered joints (and to protect my ankles from the soldered joints) I wrapped an inch of heat-shrink tubing around the connector and squirted another big blob of hot glue up the open end of the heat shrink to act as a strain relief. And the shoe pieces were complete. In theory the Lilypad can be run from a single AAA cell fitted to the power supply board. This will step-up anything from as low as 1.2v into the 5.0v needed to power the Lilypad. This worked initially but I found that driving too many LEDs at once required too much current for the single cell to provide reliably and the Lilypad would reset itself. Instead I borrowed a 3xAAA holder from an old flashlight, fitted three 750mAh AAA NiMH cells into that and soldered the output onto the power board. Now I’ve got about 4v and 2000mAh capacity… should be plenty. As a quick test I let the system sit with all 8 LEDs on for a while and it took 90 minutes to drain. Great – I’ll pack a backup set of batteries and I should be fine. A two foot length cut from the 10-way ribbon cable comes up into the camera case through a small hole I cut in the bottom and is then soldered directly onto the I/O pins of the Lilypad. I decided that it was good to show off the controller so I hot glued a patch of velcro onto the back of it & a corresponding piece onto the front of the case so I could mount it there. This also gave me access to the reset button that I could now easily use for changing modes. 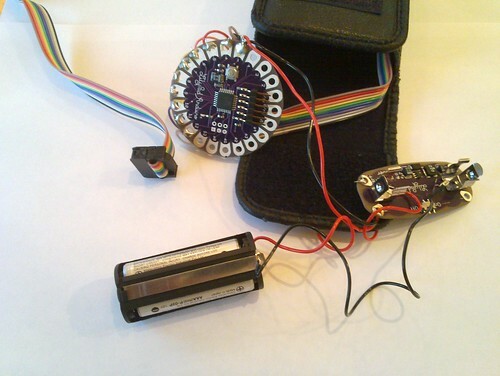 The whole contraption then slips onto a belt with the batteries in the bottom of the camera bag and the power supply board on top of them for easy access to the power switch. The cable comes out of the bottom of the case and attaches to the cable coming up the legs with any excess being easily hidden in a pocket. Connecting the control & power unit to the feet was easy. 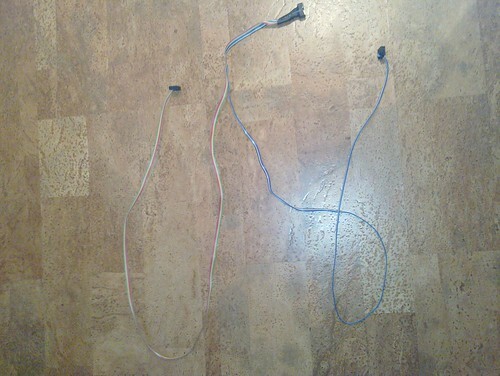 I took the remaining length of 10-way ribbon cable, ripped it up the middle for most of its length and attached connectors to the three ends. 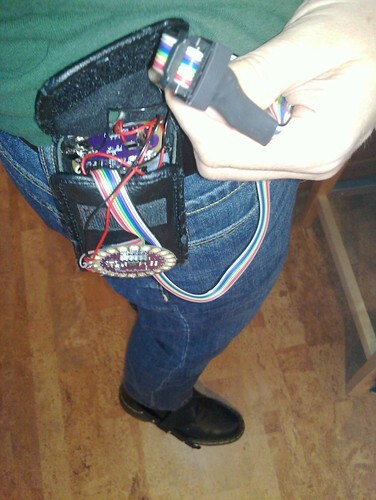 The 10-way will connect to the control & power unit, the two 5-ways will connect to the shoe pieces and most of the wiring will be hidden inside my jeans.